When you stay at the Clarion Collection Hotel Grand Bodø, you'll be ideally situated to explore the city's history and culture, as well as the beautiful natural surroundings of northern Norway. We offer gorgeous rooms, a central location and an Tonight's Special every night. The Clarion Collection Hotel Grand Bodø is located in central Bodø, close to the Glasshuset shopping street and the nearby harbour. You'll also be just around the corner from the city's excellent restaurants and cafés. Additionally, Bodø's main attractions such as the Luftfartsmuseet (Aviation Museum) and Galleri Bodøgaard are within easy reach. The hotel underwent extensive renovations in 2018 and guests can now enjoy new rooms, bathrooms, a lobby area and restaurant. The interior design takes inspiration from the 1940s and combines wonderful old mirrors and chandeliers with modern décor. From 1 June 2018, you will also be able to book two wonderful new suites. Clarion Collection Hotel Grand Bodø is cash-free, which ensures added security for our guests and visitors. More information about this can be found under FAQs. In addition to our daily breakfast buffet, we also offer all our guests Afternoon Sweets and a Tonight's Special at no extra cost. You can read more about our meals under Services. The hotel also has a lobby bar where you can enjoy delicious drinks and light meals. Our relaxation area has a wonderfully serene atmosphere, comfortable furnishings and access to the sauna, steam sauna and infra sauna. There's also an area for relaxation and socialising here, where you can relax in modern reclining chairs and where there'll always be something refreshing to drink. The hotel's conference centre has two conference rooms with a capacity for up 30 people in each. Find out more about our meeting rooms here. The hotel has a partnership with a local gym, Balansen Helse og Livstilsenter, which is located right opposite the hotel. Come here to enjoy a good workout in the gym or join an exercise class such as spinning. You will also have access to the Balansen Spa with a variety of saunas and a jacuzzi. Read more about the gym and spa facilities here. Clarion Collection Hotel Grand Bodø offers a colourful and modern setting, where history is visible in the interior design and the distinctive post-war architecture. The well-known writer Knut Hamsun is among the hotel's many famous guests. He wrote the book "Segelfoss By" in one of its rooms. 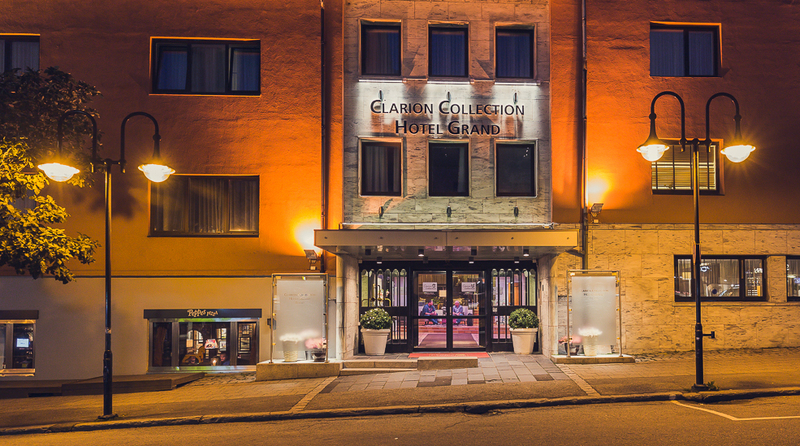 The Clarion Collection Hotel Grand Bodø has a long and dramatic history, stretching all the way back to 1850. On 27 May 1940, Bodø suffered extensive bombing raids and Anna Hoseth was alone in the hotel at the time. After seeking shelter in the basement, she was rescued at the last minute by a soldier. He came back to visit the hotel many times after the war had ended. Today, a mirror hangs in the dining room, one of the few things to have survived the bombing. Take a train to Bodø station, the last stop on the Nordland line. The bus stops at Bodø Domkirke, about 4 minutes' walk from the hotel. Bodö Airport: 2.5 km - about 6 mins by car. There is a bus stop right outside the hotel.